Roasted Tomatoes à la Provençal, a summer delicacy superb in its simplicity. A quintessential late summer dish, inspired by Julia Child’s “Mastering the Art of French Cooking,” is the perfect way to celebrate a bounty of fresh, vine-ripened tomatoes. 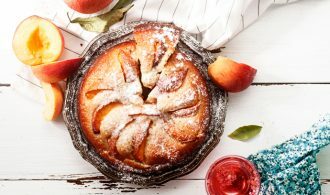 This easy summer recipe is ideal as a side dish, pretty enough for company, and delicious enough to serve many times during the season. 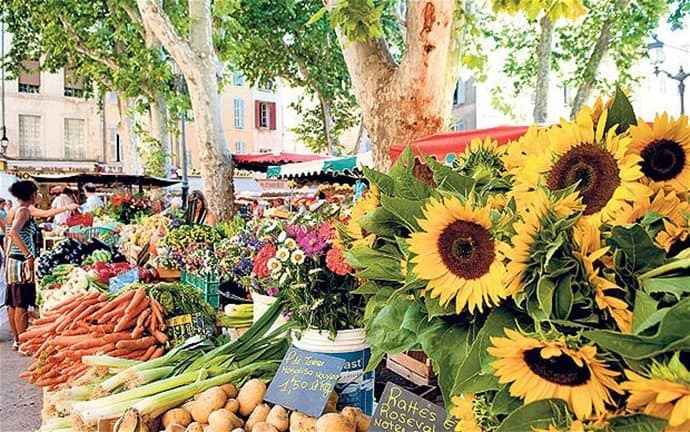 France, Bouches du Rhone, Aix en Provence, the Place Richelme, market — Visit the Telegraph for an insightful article on Provence and the south of France. Tomatoes are an integral food in Provençal cuisine. According to Maguelonne Toussaint-Samat’s “A History of Food,” tomatoes became popular as early as the 1790’s when Marseilles residents marched to Paris on the first anniversary of the fall of the Bastille. Reportedly, they demanded tomatoes. 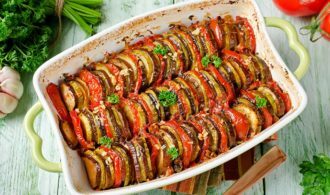 Later, tomatoes in the south of France entered the culinary spotlight not only as an ingredient in sauces, but became a dish in itself, first as a salad and later as a cooked vegetable. 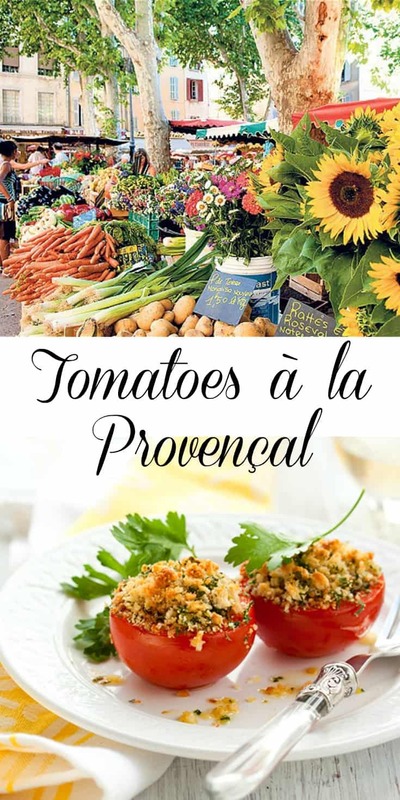 “But the best way of all to cook it, the recipe for which it was surely expressly created, is tomates à la provençale, prepared exactly as tomatoes should be,” believes Toussaint-Samat. And I would completely concur! Roasted Tomatoes à la Provençal, a summer delicacy superb in its simplicity. And a favorite of Julia Child. Slice 4 tomatoes in half and remove seeds with the tip of a knife. Place into the baking dish, cut side up. In a bowl combine the breadcrumbs, green onions, basil, parsley, garlic and thyme leaves and 1 teaspoon salt. Using a spoon, fill the tomatoes and mound each tomato with the breadcrumb stuffing. 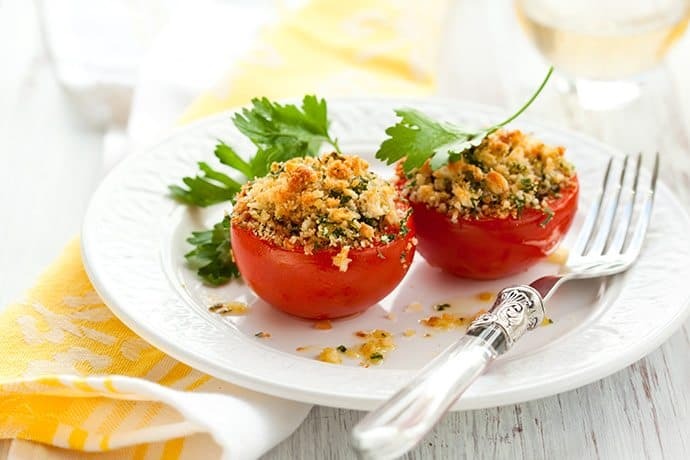 Bake the tomatoes in a 400-degree oven for about 15 minutes or until they are tender. Remove from the oven and sprinkle with Parmesan cheese and drizzle with a good quality olive oil. Return to the oven and bake for an additional minute — or until the cheese begins to melt. Garnish with fresh sprigs of basil and thyme.